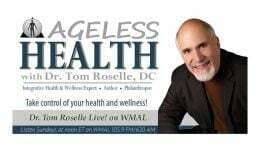 Podcast Archive - Dr. Tom Roselle Live! Seasonal, Mold and Pediatric Allergies (Special Guest: Dr. Jennifer Sims, DC) Listen to Dr. Stephanie Pina, ND, LAc interview Dr. Jennifer Sims, DC as they discuss seasonal, mold and pediatric allergies. Allergy Prevention Listen to Dr. Tom Roselle, DC and Dr. Leonard Poe, DC discuss allergies and how they may be associated with weak adrenal, immune, and digestive functions. Also discussed, spring allergy prevention and natural allergy treatments. Therapeutic Potential of Stem Cells Listen to Dr. Tom Roselle, DC discuss regenerative medicine and stem cells, including key genetic and epigenetic factors that determine stem cell properties.